LEARNING by losing can harden a team trying desperately to win. As long as they don’t keep losing, never turning the hurt of it all into championship winning armour, it can be the making of a group of eventual winners. Clare’s heroic men of ’95 and ’97 were the whipping boys of ’93 and ’94 before they swapped the dank silence of a beaten dressing room for the back-slapping on offer down the corridor. On the evening of July 31, 2008 several of the Clare U-21s that will sprint onto Croke Park next Sunday, had a Munster medal snapped from their palm. The injustice of it all could have finished them yet maybe it has helped make those who are eligible again this year. “A small bit of adversity is good test of character but I suppose, the difficulty of playing U-21 is some guys don’t get a second chance,” Clare U-21 coach Cyril Lyons reflected. “There were six lads last year who were gutted. Three of them are with us on the days of matches; James McInerney, Conor Cooney and Gary O’Connell. And they’re great lads. Their heart is with them [the team],” the Ruan man added, the memory of the 2008 Munster final and that ’65, fading but not wholly forgotten. Almost a year later to the day, July 29, 2009, the Clare U-21s headed to Dungarvan. Later that night, they shipped Clare’s first ever Munster U-21 crown back to the county. Winning it was memorable enough; winning it in Waterford topped it off. On the way down, Clare took a break in Clonmel. 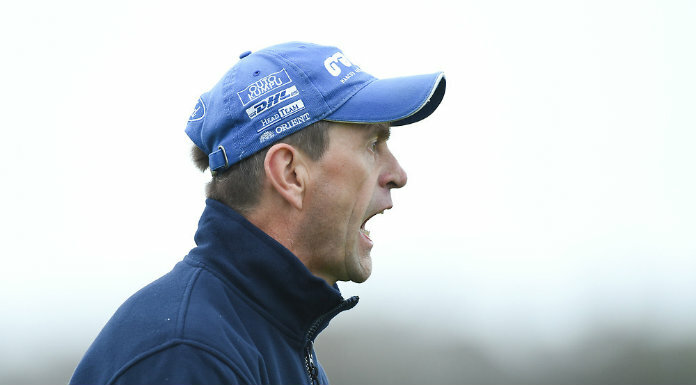 “Once we stepped back on the bus in Clonmel, going from Clonmel to Dungarvan, the atmosphere on the bus changed dramatically,” Lyons, who is in his third year coaching at U-21 level, remembers of the last Wednesday in July. “It isn’t always the perceived advantage of playing a home match for the home team. There’s always something about getting on a bus and heading into somebody else’s patch. It just prepares you mentally a little bit more. I don’t know what it is. It’s something undefined,” the Ruan National School principal feels. Wherever the venue, you need players capable of performing when it matters. Young men who have the skill, capability and match-day temperament to play when it counts. “We’re fortunate the guys we have on the panel are very well grounded and we’re also fortunate in that the lads are achievers. They want to win,” Lyons observed. “The other thing as well is club boundaries and club divisions are forgotten about, when they come into train with us. Whether that’s the benefit of having all the development squads up along or maybe lads going to college together, the club rivalry that often exists, maybe at senior level, is certainly not apparent to us. The banter after training, on the bus and at the meals would indicate that,” he added. Thus far, Clare have beaten Limerick, Waterford and Galway. “Every game has been a step up in terms of quality of the game, intensity, determination and I’m sure the next day will be no different. It’s been uplifting, I suppose, not only the fact they’re winning but also the way they play. They’ve got fantastic support from the first day against Limerick and it has grown and built since. I suppose to date, in the three matches they’ve played and even in last year’s championship, the team has given great value for money and hopefully it will continue in that vein,” Lyons said. Winning creates an atmosphere, which bristles with ambition and hope. The latter is linked to the fact that if you consistently cut it in training, you will put yourself in the frame if you’re not already on the starting 15. “I suppose in our first year involved, we were often guided by what we saw them doing with other teams rather than what we saw them doing with us. So we told the players that ‘it’s what ye do with us that counts’. We have a large panel of players and any day, you can only use 20. And other lads are just champing at the bit, demanding nearly to be put on. What we do say to them is, ‘listen lads, we’re going to watch ye play. If you impress in training and you impress with your club, you’re moving up the ladder and we’ll give you the chance,” the team coach explained. Balance is the key word. Substitutes need to know that they have a chance of leaving the dugout, while players who start and are taken off must be discouraged from losing confidence. “It’s a very easy thing to do. ‘I was taken off. I’ve lost my place, I’m gone’. We have repeatedly said to lads, ‘that was the last match. It’s how you prepare for the next match is going to determine who is going to be on and who’s going to be brought on the next day’,” Lyons stated. The management quartet were hoping to get a run out in Croke Park before Sunday. Getting a sense of the place could help Clare to settle soon after throw-in. “Guys say ‘what boots do I wear? What way is the wind?’ Just the familiarity factor of how the ball bounces on the ground – does it shoot at you or does come up to you or even rising and lifting the ball, hitting long-range shots. When you look at the post at a glance, what catches your eye? Is it the post or is it the pole behind the goals?” Lyons surmised, remembering his own playing days. Matching club demands with those of a county team constitutes a delicate balancing act. Clare have been given two weeks free of club hurling this time around. “I think we basically have a common-sense approach to it. Club fixtures have to go on and also lads like to play their matches. I was a bit disappointed for the last round (versus Galway). I thought we just needed one more session but we didn’t get it. But there is a balance involved,” the 1995 All-Ireland medalist acknowledged. As for his own feelings, as the weekend approaches, is the challenge involved dominating his thoughts or is the pure excitement of it all getting the upperhand? “I would say it’s a combination of both. If you aren’t excited about being in an All-Ireland final, why be involved?” Cyril Lyons asked, exuding a controlled calm, which Clare will need an abundant supply of on Sunday.